이 불상은 현재 종로구 창신동 지장암 대웅전의 삼신불상(三身佛像) 중 중앙에 있는 목조비로자나불좌상으로 1924년 강재희(姜在喜) 거사가 지장암을 중창하면서 이곳에 모셨다고 전한다. 앉은 높이가 117.5cm달하는 중형의 목조불상으로 보존상태는 양호하다. 이 상에서는 푸른 명주바탕에 붉은 글씨로 쓴 조성발원문(造成發願文)이 발견 되었다. 그 발원문에서 이 불상의 원 봉안처는 조선시대 왕실의 부녀자들이 출가 수행하던 자인수양사(慈仁壽兩寺)이며, 광해군의 정비인 장열왕비(章烈王妃, 문성군부인 유씨/1576~1623)가 광해군과 세자, 세자빈, 본인 및 작고한 친정부모, 작고한 대군과 공주의 천도를 위해 모두 11존의 불상과 불화를 동시에 조성하였다고 밝히고 있다. 이 상은 11존상 중 하나이며, 현재까지 밝혀진 유일한 예에 속한다. 이 불상은 당대 최고의 고승 벽암 각성(碧巖 覺性)의 감수 아래 현진(玄眞), 응원(應元), 수연(守衍), 옥명(玉明), 법령(法玲), 명은(明訔), 청허(淸虛), 성인(性仁), 보희(普熙), 인균(印均), 경현(敬玄), 지수(志修), 태감(太鑑) 등 13명의 조상화원(造像畵員)과 성옥(性玉), 승일(勝一), 밀연(密衍), 의인(義仁) 등 4명의 치장(治匠)이 참여하였다. 이들은 17세기 각기 하나의 유파를 형성하며 시대를 풍미했던 조각승들로 당시 자인수양사 불사(佛事)의 중요성을 짐작할 수 있다. 이 지장암 비로자나불상은 당당한 불신표현에 얼굴의 표정은 순박하면서도 위엄이 있다. 몸체는 등에서 약간 앞으로 굽었고 법의의 옷 주름 표현이 부드러우며 볼륨감이 있고 자연스러우며 생동감이 넘친다. 이러한 얼굴표현은 현진과 수연이 으뜸 조각승〔首畵員〕으로 참여한 불상들과 비교되며, 신체와 옷 주름의 표현은 응원과 인균이 만든 유파의 불상들과 양식적으로 상통한다. 비로자나불의 지권인 (智拳印) 수인(手印)은 오른손으로 주먹 쥔 왼손을 덮은 모습인데, 이러한 수인은 전대에는 찾아 볼 수 없고 17세기 이후에 새롭게 대두된 것으로 현진(玄眞)이 제작한 1624년 법주사 대웅전 소조비로자나불상이 있고, 현진의 작풍을 계승한 청헌(淸憲)이 조성한 구례 화엄사 대웅전 목조비로자나불상도 이러한 지권인을 취하고 있어 현진파의 조상작품과 관련성이 있다. 이 불상은 광해군의 정비인 장열왕비가 직접 발원하여 조성한 왕실발원 불사라는 역사적인 가치와 17세기 전국에 걸쳐 활약한 대표적인 조각승들이 참여하여 공동작업으로 이룩한 작품이라는 점에서 큰 의의가 있다. This is one of the three Buddhist statues housed in Daeungjeon Hall of Jijangam Hermitage in Seoul (Changsin-dong, Jongno-gu), representing the Buddha triad (Three Bodies of Buddha). This mid-size Wooden Seated Vairocana Buddha, 117.5cm in height, sits in the middle in the row of three Buddhas, placed next to each other, and is in a decent state of preservation. The statue is said to have been housed in Jijangam Hermitage, in 1924 when the hermitage was rebuilt by the monk Kang Jae-hui. Inside the statue, a prayer text written in red on a piece of blue silk cloth has been discovered. According to this prayer text, the Vairocana Buddha statue was originally housed in Jainsuyangsa Temple, a temple used during the Joseon Dynasty by women of the royal family when they went on a spiritual retreat. According to the same prayer text, Jangyeol, Queen Consort to King Gwanghaegun, sponsored the creation of eleven Buddhist paintings and sculptures, all at the same time, to pray for the rebirth in Paradise of her husband, the crown prince, the crown princess, herself, her late parents and other deceased princes and princesses. 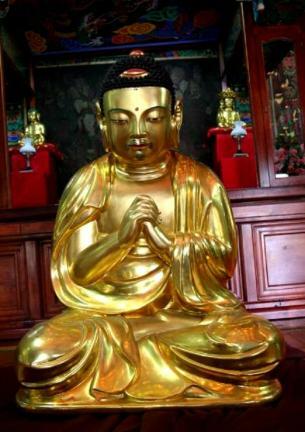 The Vairocana Buddha of Jijangam is the only known surviving example of the eleven statues created at this time. In the creation of this Buddhist statue, thirteen monk sculptors, including Hyeonjin, Eungwon, Suyeon, Okmyeong, Beopryeong, Myeongeun, Cheongheo, Seongin, Bohui, Ingyun, Gyeonghyeon, Jisu, and Taegam, and four metalworkers, including Seongok, Seungil, Milyeon and Uiin. The project was supervised by a prominent senior monk named Byeogam. All those who are listed as participants of this sculpting project were renowned monk sculptors of the 17th century, belonging to various schools of Buddhist sculpture that existed then; a measure of the importance and prestige of Jainsuyangsa Temple, this temple frequented by Joseon’s royal women. The Vairocana statue of Jijangam Hermitage has a candid face, which at the same time exudes authority. The back is slightly bent forward, and the drapery is depicted with softness and in a highly natural and lively manner which also keeps the feeling of volume alive. These facial features evoke those of other Buddhist statues, in whose creation Hyeonjin and Suyeon participated as head sculptors. Meanwhile, in terms of bodily details and treatment of drapery, this statue shows similarities with sculptures by Eungwon and Ingyun. Vairocana Buddha holds his hands in the vajra mudra, covering the fisted left hand with the right hand. This mudra first appeared in Buddhist statues during the 17th century. The Clay Vairocana Buddha at Daeungjeon Hall of Beopjusa Temple (1624) by Hyeonjin and the Wooden Vairocana Buddha at Daeungjeon Hall of Hwaeomsa Temple in Gurye, created by Cheongheon, in a style echoing the latter’s style are two of the examples in which Buddha assumes a similar hand posture. This particular style of mudra is, therefore, a signature detail of works by Hyeonjin and his followers. This statue is of great significance in that it was created under the direct patronage of Queen Jangyeol and that it is a collaborative work of major Joseon monk sculptors of the 17th century.